OXFORD, North Carolina (WTVD) -- If you see Louise Inscoe, there's a good chance you'll see her carrying a ball of yarn. "I spend a lot of time crocheting," she told me. "We live in Oxford and if we go to shop in Raleigh, all the way there and all the way back I have a crochet project in my hand." Louise's love of crocheting is more than a hobby. It's a ministry. "Several years ago," she explained, "one of the members of the church I belonged to as a child had on Facebook where she was starting a prayer shawl ministry. And I said, 'Do you need help? Because I love to crochet.' And that started the ball rolling." She's now created more than a thousand crocheted works. Blankets, mostly, but also pullover caps and prayer cloths. 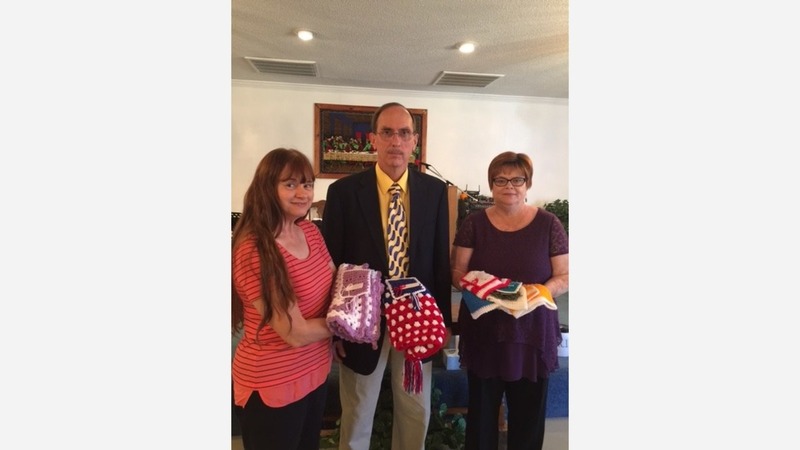 Louise takes the finished projects to her church, Stovall Church of God in Granville County, where they are prayed over and blessed, and then given out to the congregation to give to others. "Anyone who knows someone who is sick or in need, whether it's cancer, depression, no matter what the issue is, they take it to the person they know has a need," she said. And one person who loves to do just that is church member Ellen Campbell. She's a cancer survivor who's made it a personal mission to give out Louise's crochet projects to cancer patients at the hospital. "I go back and I talk to each patient that's taking treatments and I offer them these," Ellen said. "They're appreciative. They thank me numerous times as I walk by. I do it because I know what it's like to be sitting in that chair." Every stitch and slip knot is a labor of love. And with each item Louise makes, she always includes a little note which reads in part: "As you hold your Pocket Prayer Cloth, you hold the hand of God. May you feel His loving and comforting touch." Ellen Campbell -- cancer-free for nearly ten years now -- knows all about that comforting touch and is eager for others to know about it. "I just want them to know they don't have to be so worried, so stressed out. If you believe in God, give it over to Him," she said. "It's a blessing, the ministry they have there," said Stovall's pastor, Carroll Glasscock. "They are great ladies and we're very proud of what they're doing."